Located at the border with the US, Chihuahua has benefited from FDI and NAFTA. Chihuahua has been one of the richest regions in Mexico and one of the most dynamic in the OECD. However, the region’s FDI-trade link with the USA has also led to some vulnerability to external shocks. The two crises affecting the USA in the past decade affected Chihuahua more than any other state. Despite recent progress in the quality of education, other structural challenges such as lower productivity growth, high inactivity rates and dwindling employment rates have been factors in Chihuahua’s sluggish growth. Chihuahua not only displays large intra-regional and gender inequalities, but also the largest inter-ethnic inequality levels in the country. Chihuahua can gain from a territorial approach to policymaking that integrates sectoral policies, fostering value-added in rural activities, better linking SME-development and FDI-attraction policies, as well as between innovation capacities and applications. The region could also strengthen their recent inclusive governance arrangement with civil society and the private sector. Growth and development can only be possible if the current challenges in insecurity, water shortage and public finance are addressed. 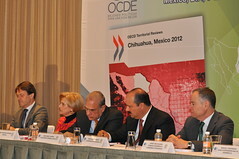 Secretary-General of the OECD at the presentation of the Territorial Review of Chihuahua, Mexico.